Since the start of the relationship with Farringtons School in 2009, SEA have worked on a variety of projects from a co-educational transition campaign to prospectus and online communications. View the Farringtons overview video here. More recently, from our recommendation, Farringtons School wished to use cutting edge, interactive augmented reality (AR) technology to engage with prospective parents and students through their prospectus. It was also established that on open day tours of the school there were many unoccupied classrooms and we wanted to find a way to bring them to life. 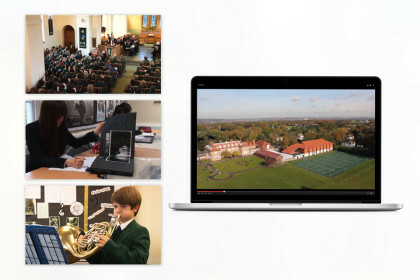 As video has the ability to reach, engage and convert a target market and instantly convey brand and personality in a way that other media cannot, we were commissioned to plan, film, edit and upload a series of 16 videos for digital overlay in their prospectus and at certain ‘hotspots’ throughout the school tour. As these videos are not available to view publicly, please contact hollie@sea-ltd.co.uk to view a demo showreel.